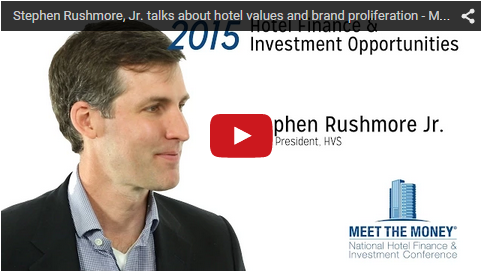 Stephen Rushmore, Jr., President and CEO of HVS, speaks in the video below about hotel values in the next few years, new development, and brand proliferation. Stephen spoke with David Sudeck, a senior partner in the JMBM Global Hospitality Group®, as part of our video interview series on hotel finance and investment opportunities in 2015. 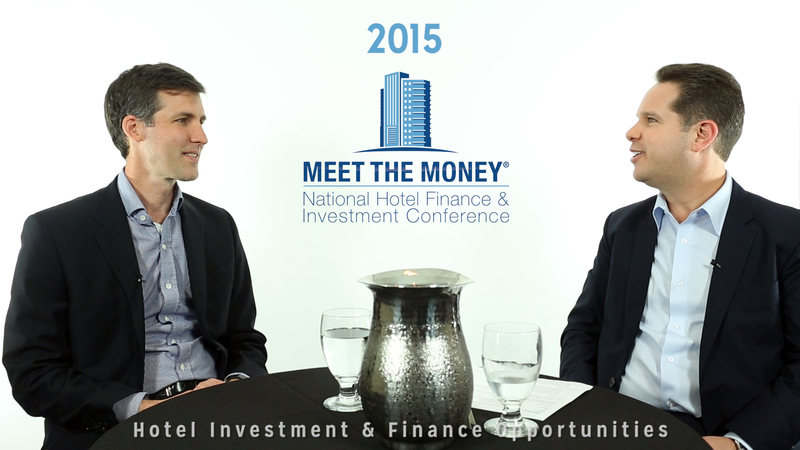 David Sudeck: We are at the 25th Annual Meet the Money® Conference 2015. I am happy to be here with Stephen Rushmore, President and CEO of HVS. Welcome, Stephen. Stephen Rushmore, Jr.: Good to be here. Thanks. David Sudeck: First of all, tell us how you’re feeling about the Meet the Money® Conference and how this year differs from last year? Stephen Rushmore, Jr.: It’s going very well. Clearly, the hotel economy’s doing quite well. Everyone’s a hero. [It’s] very easy to be successful right now. Good times, need to start thinking about what are the threats to all the growth and success that we’ve been having. David Sudeck: Morale seems to be very high but there does seem to be, and you covered this in the most recent lunch presentation, a little bit of potential for dark clouds on the horizon. Can you tell us about what you see in the general economy and where you think HVS may be going over the next few years in terms of services? Stephen Rushmore, Jr.: Sure, there are a couple questions there. I think the things that hoteliers need to be thinking about from the investment side is supply, and when is the growth rate of supply going to be overtaking demand? It’s very market-dependent, clearly, and it’s already occurred in some markets. That’s something that people need to keep a close watch on. The other is interest rates, as well. Those are at all-time lows, and really the only place to go is up and that will negatively impact values. But in the foreseeable future, the next couple of years should be good for hotel values. When we start the next downturn, I don’t think it’s going to be as precipitous as the last one that we had. I think those scars are still pretty visible from the last cycle, so it will be a softer, gentler landing. David Sudeck: I’m hoping we’re seeing a more disciplined cycle this time around. Stephen Rushmore, Jr.: Yes. I hope so too, as well. David Sudeck: Certainly our lending clients seemed to be more disciplined and the loans are, for what I can tell, structured more responsibly. Stephen Rushmore, Jr.: Yes, we’re seeing the same thing as well. David Sudeck: Just talking about recession and downturn, what are the last five years been like for HVS and what do you see going forward? What are you working on now, just in terms of getting a sense of the cycles? Stephen Rushmore, Jr.: Sure, in the latter part of around 2010 or so, they were dealing a lot more with distress assets, litigation works, rebranding as people trying to figure out how to reposition their properties and what makes sense. Now we’re doing a lot more feasibility studies then before, lots of proposed properties out there. People [are] trying to get a sense for when our replacement costs going to be lower than what values are to identify building opportunities. David Sudeck: Are you seeing a lot of new development? Stephen Rushmore, Jr.: A lot of interest in new development. It’s certainly starting to pick up. We think that, and our predictions are that some time, the end of 2016, early 2017, the supply growth will be an equilibrium with demand growth and then overtake it and for a few years after that. David Sudeck: You said you told me earlier you were working in both domestic and international assignments. David Sudeck: Can you give me a sense as to how those two markets are different, both in terms of your focus and generally the marketplace? Stephen Rushmore, Jr.: Sure. Overall the global economy is doing well, and clearly it’s marking regional specific, but Europe has been bouncing back strongly for us for the last couple of years, which is good. We just opened up an office in Africa a few months ago. Stephen Rushmore, Jr.: Thank you. We knew that’s a volatile market. But we’re doing quite well there. We’re meeting our expectations. Middle East, Dubai, is just doing incredibly well. They actually thrive on the instability in the Middle East because it’s a safe haven, really. Asia has its ups and downs, market specific; Indonesian is doing very well. South America is doing fair, I would say. David Sudeck: In your international marketplace, are you focusing on the same appraisal? And feasibility? Stephen Rushmore, Jr.: More on the feasibility side of work there. The appraisal industry is more mature in the United States, and I guess easier to get into when and there’s also large economy of appraisal work in the United States. We can do it. When you’re talking about Asia, well really, every country has their own sort of regulations on how to do appraisals, so if we’re going to do it in markets, it’s ones where there’s a big pie. But you don’t need to be certified, there’s no designation required to do feasibility studies, so we can do that anywhere in the world. About two-thirds or so of our work outside the United States is for proposed properties. David Sudeck: Do you have any plans for new services, new platforms, expansion, other than geographically? Stephen Rushmore, Jr.: Actually, it’s almost the opposite of that. We as a company are going through a strategic planning process at the moment. And it’s likely that we’re going to, we offer about a dozen “services” at the moment. We’re probably going to end up paring that down and focus on a few and play to win in the ones that we’re going to do. David Sudeck: That’s great. What’s keeping you up at night? What do you see? We talked about dark clouds earlier–it feels to me like the market is frothy, it’s hot, at least domestically. Cap rates are low, interest rates are low, interest rate increases are potentially on the horizon. Where do you see the market going? What keeps you up? Stephen Rushmore, Jr.: I’m up late at night because there’s so much going on right now. There’s so much good news going on and we’re capitalizing on that. I think one thing that I would be nervous about, aside from the macro economic issues with interest rates and supply is the proliferation of brands that are out there right now. There’s been talk about it. I had a conversation a couple of days ago with a number of hoteliers, all in the industry, pretty seasoned professionals and we, ourselves, who are in the industry, have a hard time keeping up with what brands are associated to what hotel companies. And I think if we are in the industry and we can’t get that, what does that say about the consumer? And so I think there needs to be close attention being paid to just the importance of the brands that the hotel companies have and the dilution of that and how they’re really going to be differentiated from an independent property because there’s so many brands and sub-brands out there that it has become very diluted. David Sudeck: Although some of it I think is intentional. Obviously, IHG just bought Kimpton–even that’s to enter the boutique market place. You’ve got the Moxie brand with Marriott. A lot of it is, I think, to create an independent feel to what is a big brand. Stephen Rushmore, Jr.: Right. And also from the brand standpoint is, they need to be responsible for their shareholders and to grow and they see that as an easy way to grow. But is it the right way to grow? I’m not sure. I think that the debate’s still out on that and that’s one of the things if I was a hotel owner, I would be concerned about. David Sudeck: From my perspective, from a legal perspective, my concern is areas of protection, territorial restrictions. What you’ll frequently see is that you’ll get protection as to that sub-brand but it allows clear entry on the other brands and so you’ve got, obviously, potential internal competition within your own brand where you think you’ve got the loyalty of the honors members or Starwood SPG members, for example, or you may have a dilution. I don’t know if you’re seeing that, or if that’s something that actually gets built into your feasibilities studies, your appraisals or otherwise? Stephen Rushmore, Jr.: It’s starting to become more noticeable on a concern that it hasn’t rang the warning bells yet. But that’s something that needs to be monitored. David Sudeck: We’ve been given assurance that the impact policy of these various companies will protect the franchisees. But we’ll see. Anything else that you’d like to discuss with our audience? Stephen Rushmore, Jr.: No. I think that’s it. David Sudeck: Congratulations on your success, and obviously you want to capitalize on it while you can. Stephen Rushmore, Jr.: Thanks so much. Stephen Rushmore, Jr.: Yes. Alright, bye.